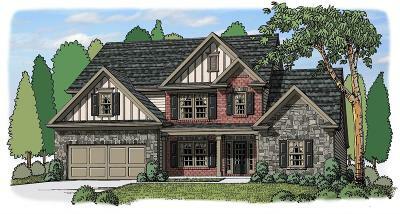 Our most popular master-on-main Kirkland plan on a 1+ acre homesite with no restrictive covenants! Brick and stone accents and a rocking chair front porch highlight the classically styled front exterior of this brand new 4-bedroom home. Inside, the two-story great room and open plan are filled with sunlight from two stories of windows. 5" hand-scraped hardwoods flow from the foyer to the gallery, great room and kitchen. There are tons of cabinets and prep space in the beautiful kitchen, with granite countertops, soft-close drawers, tile backsplash. 4 large bedrooms with HUGE closets. Master on main with 2 large closets, separate tub and shower, his-and-her vanities. Tile baths and laundry. Stacked-stone direct-vent fireplace with raised hearth. Vaulted and tray ceilings. Under construction now with completion planned for Spring, 2019!